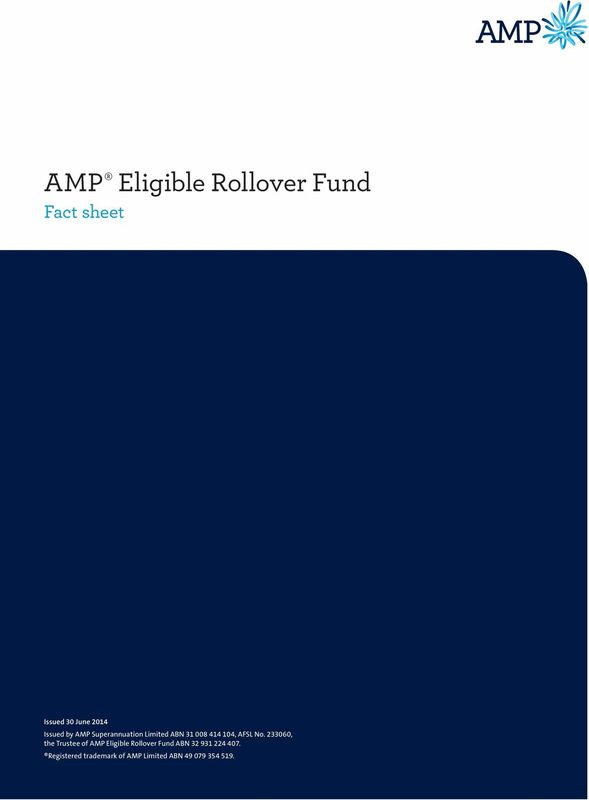 Download "AMP Eligible Rollover Fund"
2 This is the Fact sheet for AMP Eligible Rollover Fund. This Fact sheet is an important document. 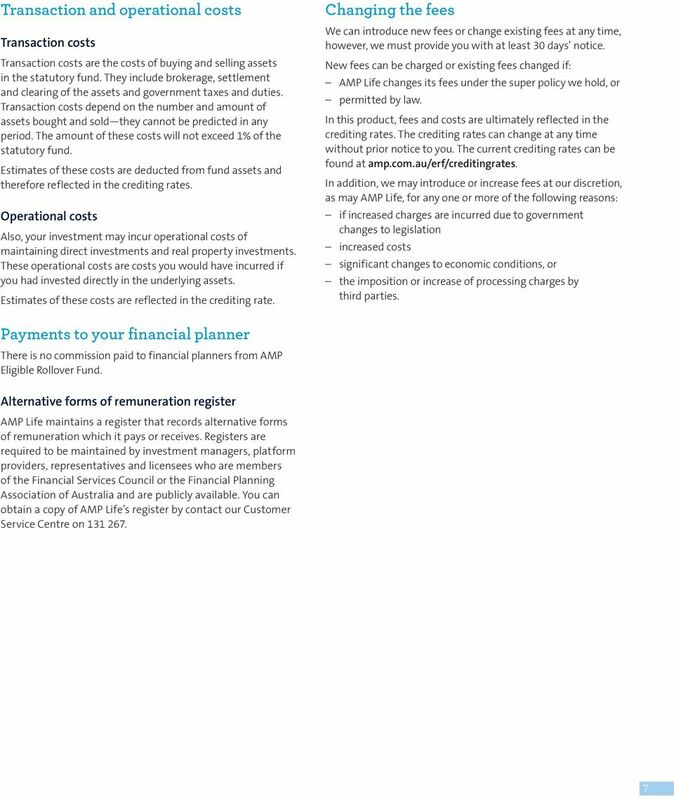 The information in this Fact sheet forms part of the AMP Eligible Rollover Fund Product Disclosure Statement (PDS) dated 30 June You should consider the PDS and this Fact sheet before making any decision about whether to acquire or continue to hold an account in AMP Eligible Rollover Fund. The PDS is available online at amp.com.au/erf. The information in this Fact sheet is of a general nature only. It is not based on your personal objectives, financial situation and needs. 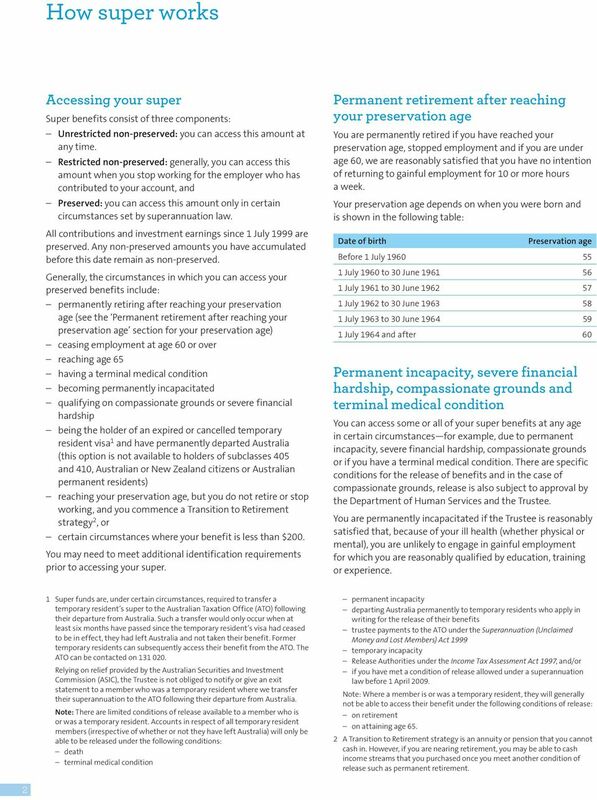 You should consider whether the information in this Fact sheet is appropriate for you in accordance with your objectives, financial situation and needs. To obtain advice or more information about the information covered in the PDS you should speak to a licensed or authorised financial planner. 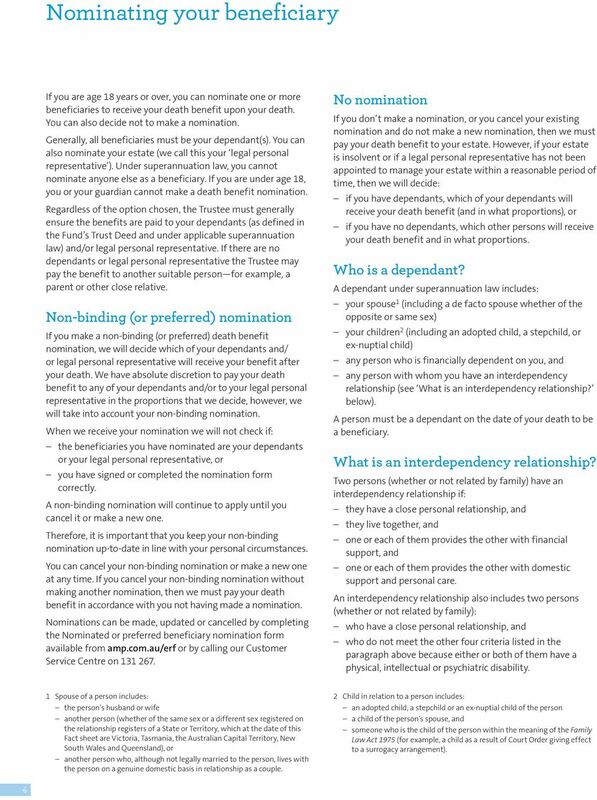 Changes to this Fact sheet Information in the PDS and Fact sheet may change from time to time. We may update information which is not materially adverse to you on amp.com.au/pdsupdates. The information can also be obtained without charge by calling our Customer Service Centre on or from your financial planner. 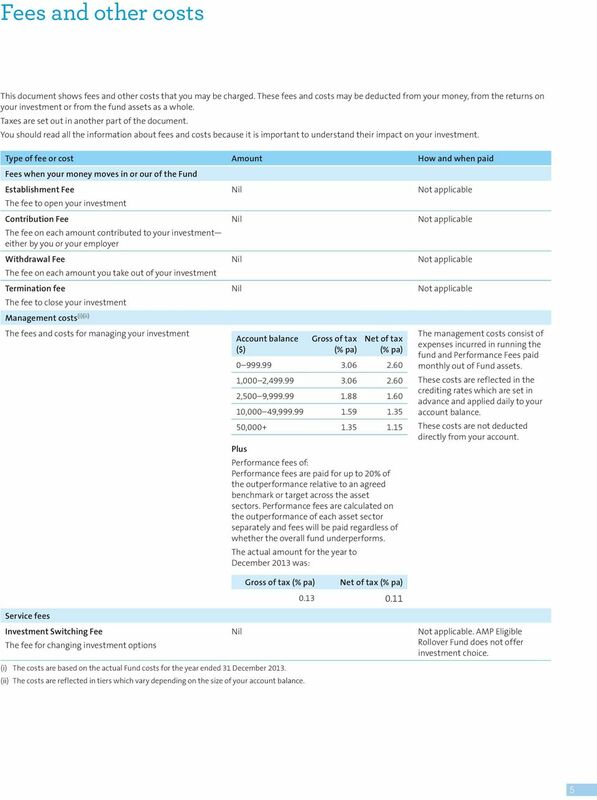 AMP Superannuation Limited and other providers AMP Superannuation Limited is the Trustee of AMP Eligible Rollover Fund and is referred to as Trustee, we or us in this Fact sheet. AMP Life Limited (AMP Life) guarantees that the rate of return will never be negative. 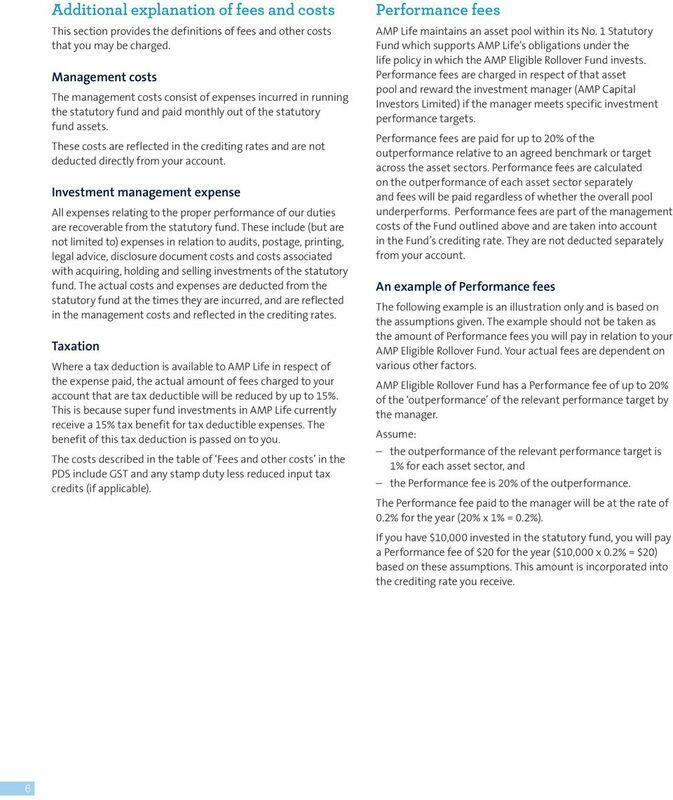 Apart from this, neither the Trustee, or any other company in the AMP group or any of the investment managers of AMP Eligible Rollover Fund: is responsible for any statements or representations made in this Fact sheet, or guarantees the performance of the Trustee s obligations to members nor assumes any liability to members in connection with AMP Eligible Rollover Fund. An investment in AMP Eligible Rollover Fund is not a deposit with the Trustee and is not a deposit with, or other liability of, AMP Bank Limited ABN , AFSL No (AMP Bank), or any other company in the AMP group. The Trustee is not a bank. The AMP Bank does not stand behind the Trustee. 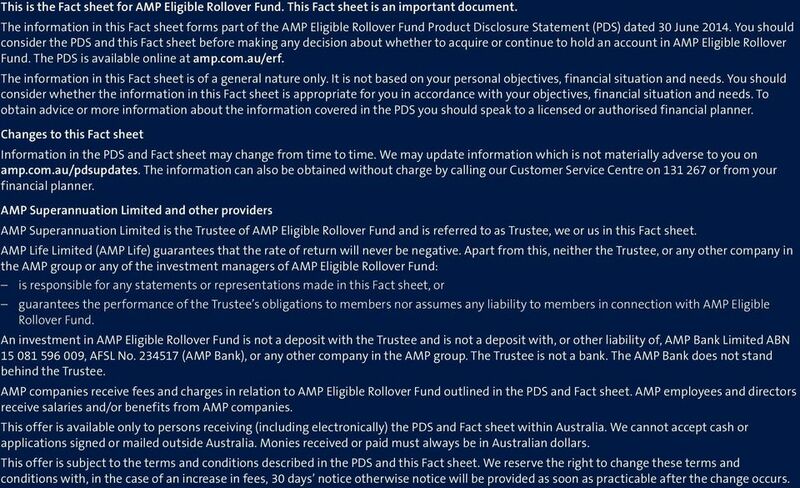 AMP companies receive fees and charges in relation to AMP Eligible Rollover Fund outlined in the PDS and Fact sheet. AMP employees and directors receive salaries and/or benefits from AMP companies. 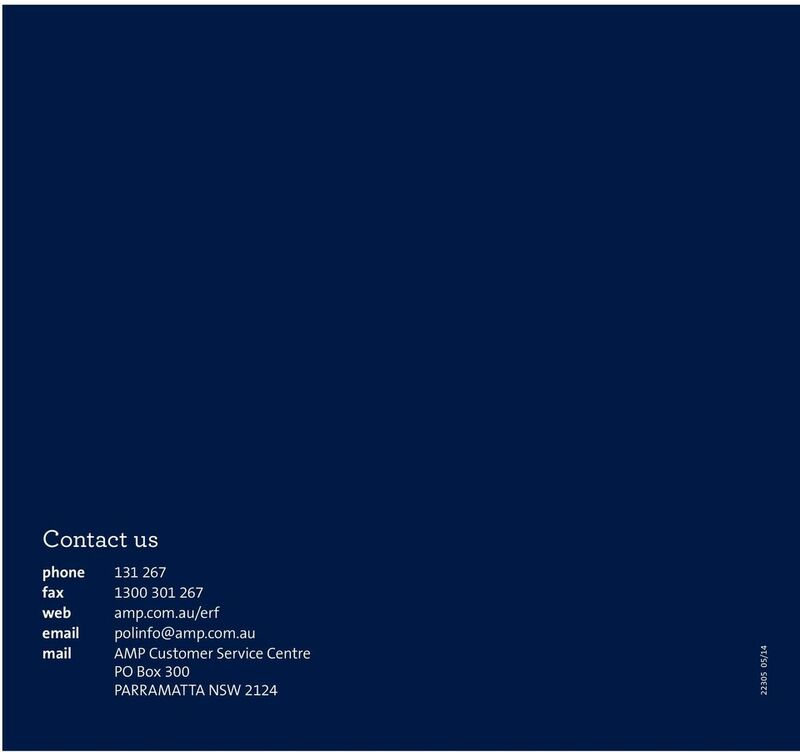 This offer is available only to persons receiving (including electronically) the PDS and Fact sheet within Australia. We cannot accept cash or applications signed or mailed outside Australia. Monies received or paid must always be in Australian dollars. 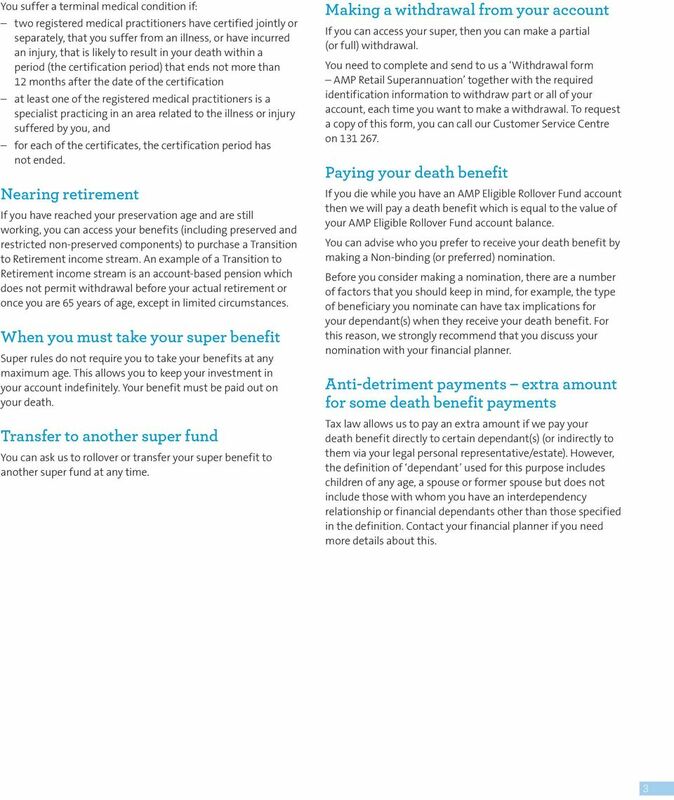 This offer is subject to the terms and conditions described in the PDS and this Fact sheet. We reserve the right to change these terms and conditions with, in the case of an increase in fees, 30 days notice otherwise notice will be provided as soon as practicable after the change occurs. 10 8 This page has been left blank intentionally.